Looking for a charming Gatlinburg cabin where your family can enjoy some peace and quiet among the Smoky Mountain woods? 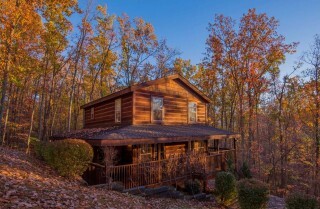 Check out Amy’s Place, a semi-private cabin for 6 that’s about 14 miles from downtown. With 2 bedrooms and 2 bathrooms, Amy’s Place is a perfect size for a single family vacation or a small group getaway. 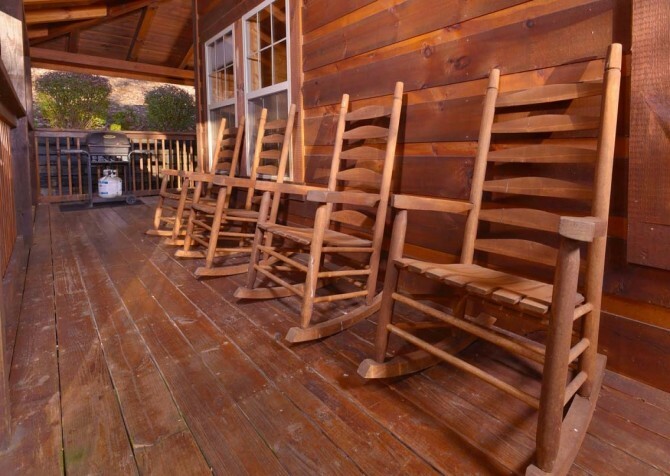 You can also rent Jud’s Place, which is conveniently located right next door, and take a larger group while still maintaining your separate spaces. At Amy’s Place, you’ll enjoy a comfortable interior, lots of great amenities, and a wooded view that’s gorgeous in the fall. 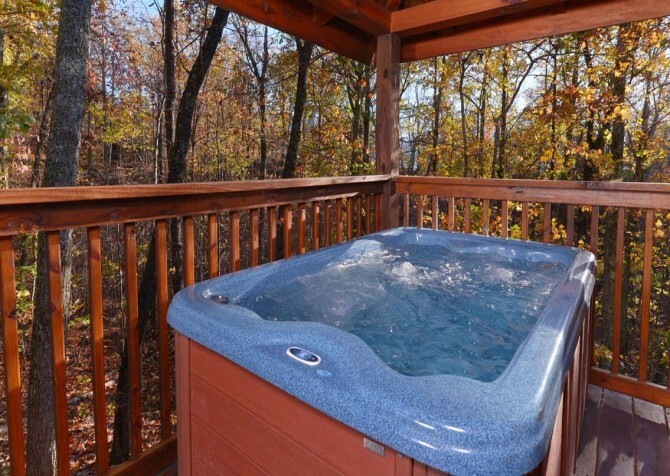 Besides a private outdoor hot tub, this cabin also provides outdoor pool access thanks to its location inside the Cobbly Nob Resort. 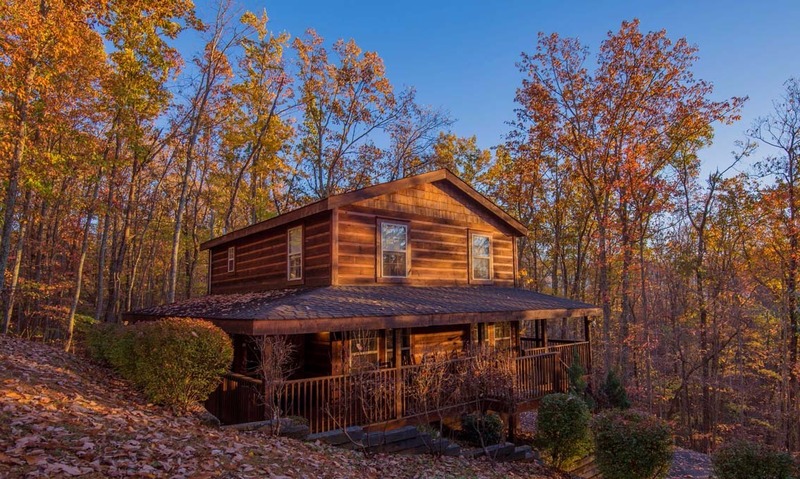 Plan for a family vacation during fall break, a holiday retreat, or a summertime escape at Amy’s Place, where you’ll enjoy the beauty of the great outdoors and a cozy cabin that feels like home! 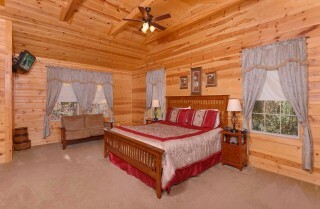 Amy’s Place offers a spacious, cozy interior from its warmly decorated bedrooms to its large living room. The focal point of the living room is the large, floor-to-ceiling stone fireplace. 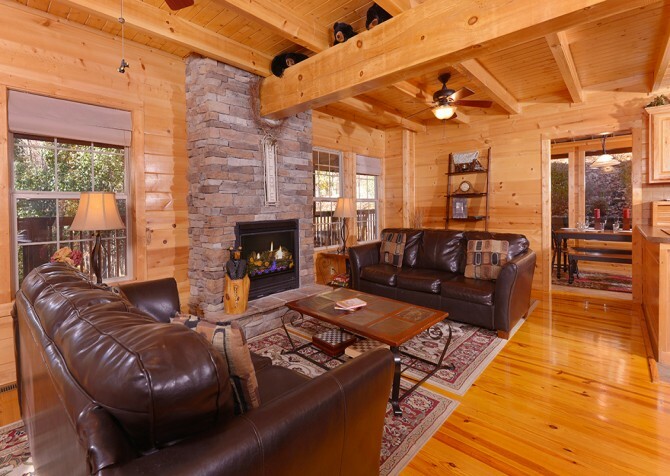 Because it runs on gas, the fireplace is easy to use and makes for a perfect addition on those chilly nights during a fall foliage visit to Gatlinburg. 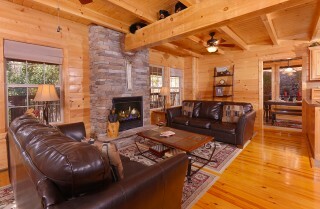 Surrounding the fireplace are 2 large couches with room for your small group. 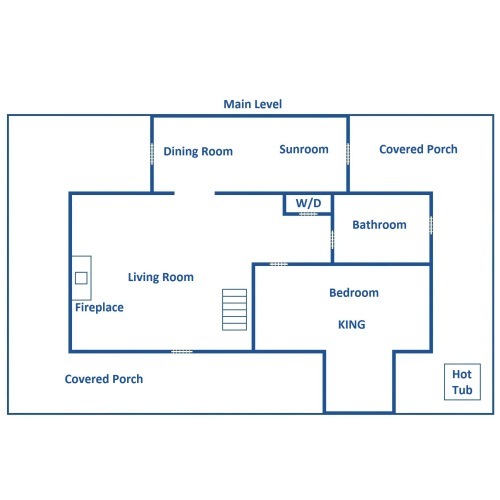 Play a game together using the coffee table in the center of this room or plan for a family movie night using the living room’s big screen TV and Blu-ray player. 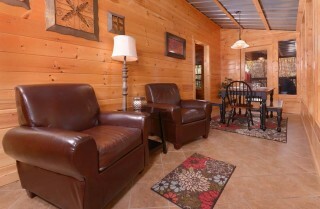 You’ll also find a DVD player and CD player inside Amy’s Place for your convenience. 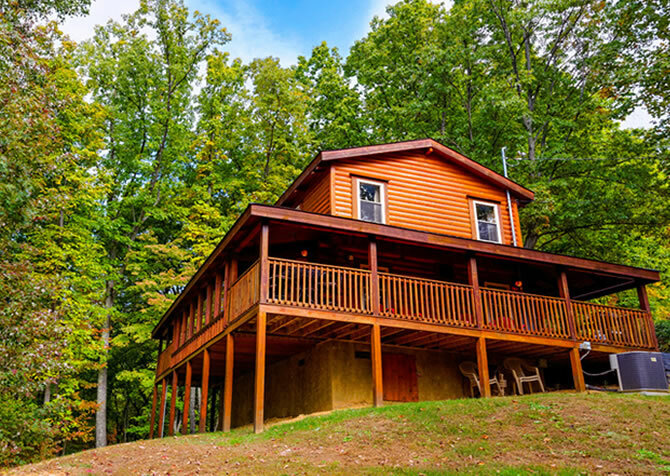 We invite you to make some easy snacks—or pick up some Smoky Mountain specialties like a delicious selection of cheeses from The Cheese Cupboard in The Village—and enjoy family time in your large living room at Amy’s Place! 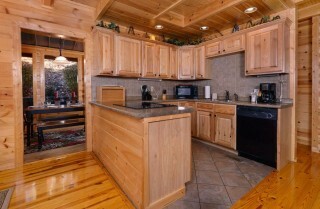 You’ll think you’ve stepped into a show house when you see the beautiful, updated, full-size kitchen inside Amy’s Place! With recessed lighting, granite countertops, gorgeous wood cabinets with an oak finish, and black appliances, this kitchen offers the essentials for a family or small group stay in Gatlinburg. 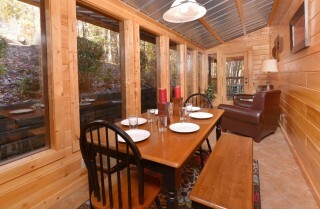 Stop by the Gatlinburg Farmers Market and cook family meals in the cabin in true farm-to-table style. Or you can choose one of our Cabins for YOU vacation packages, including ready-to-go snacks for a picnic or a romantic meal for 2. Be sure to ask our reservation specialists about more vacation packages, gift baskets, and special add-ons you can enjoy during your stay at Amy’s Place! The dining room inside Amy’s Place is truly a special spot. Large windows run alongside the black-and-stained wood dining table, providing plenty of natural light during your family’s in-cabin meals. The table will easily fit a small group with its 2 chairs and 2 benches, and you’ll find the separate dining space to be an intimate, quiet space where you can share your favorite homemade recipes along with your newly made Smoky Mountain memories! There is even a lovely sitting area with 2 chairs, a lamp, and a table in between, which is the perfect place to sit down with a book and enjoy the quiet of the mountains. And the tin ceiling here is a unique and charming touch! If you want to eat outdoors, Amy’s Place also provides a 4-piece dining set on the corner of the deck. This sturdy dining set is covered by the deck and surrounded by Smoky Mountain trees, providing a private, peaceful space to dine nearly any time of year. You might also use this table as a place to sip coffee and catch up on the news in the morning or as a perfect spot to play cards with the kids. While we encourage you to bring cards and board games for indoor fun, Amy’s Place also provides its own exciting options for entertainment. Inside the spacious game room, which is flooded with natural light and offers plenty of floor space, is a double-sided game table with air hockey on one side and pool on the other. There’s also a dart board, a CD player, and a sleeper sofa (for those moments when all you really need is a quiet space to take a short nap). The game room inside Amy’s Place provides plenty of fun options for rainy afternoons and late-night fun in the cabin! Amy’s Place has 2 large bedrooms—1 on the main floor and 1 on the second floor, offering plenty of privacy to your group. The first-floor bedroom features a king-size bed, its own TV, a writing desk, windows to let in natural light, and many other homey accessories. 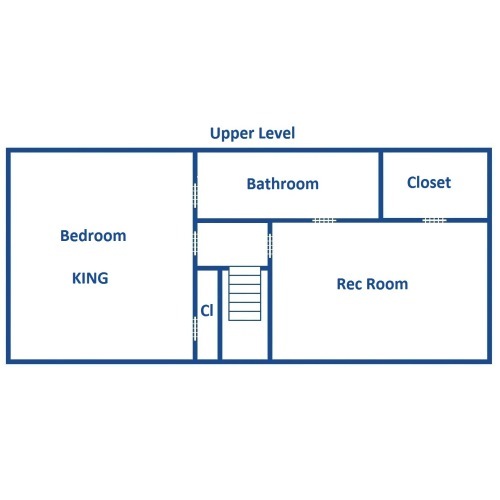 The second bedroom can be found on the same floor as the game room. 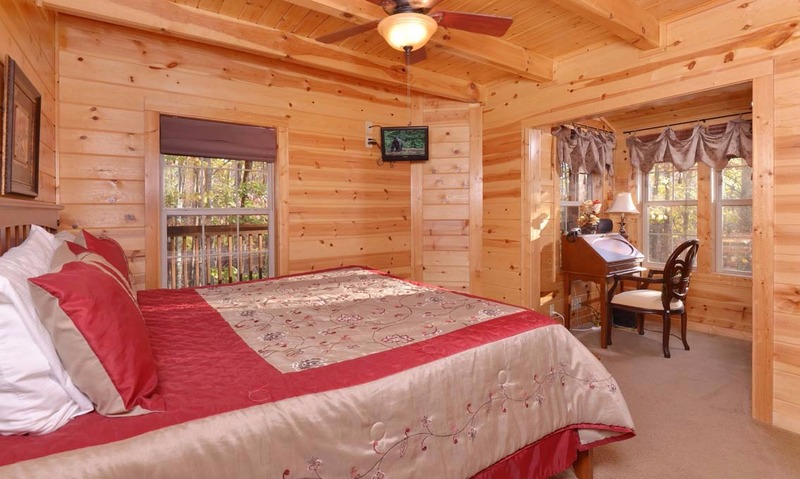 This bedroom offers a bit more floor space, another king-size bed, and its own TV as well. You’ll also be close to the sleeper sofa in the game room, which is a great choice for kids who are tagging along for your Gatlinburg vacation. Total, Amy’s Place comfortably sleeps 6 guests with its 2 bedrooms and extra sleeper, and you’ll find the 2 bathrooms inside this cabin to be plenty large enough for all 6 guests to share. If you’re planning a visit to the Smokies for one of its annual fall events— like Gatlinburg’s Taste of Autumn—be sure to choose a wooded cabin like Amy’s Place, which will be surrounded by a gorgeous array of colors during the changing of the seasons. 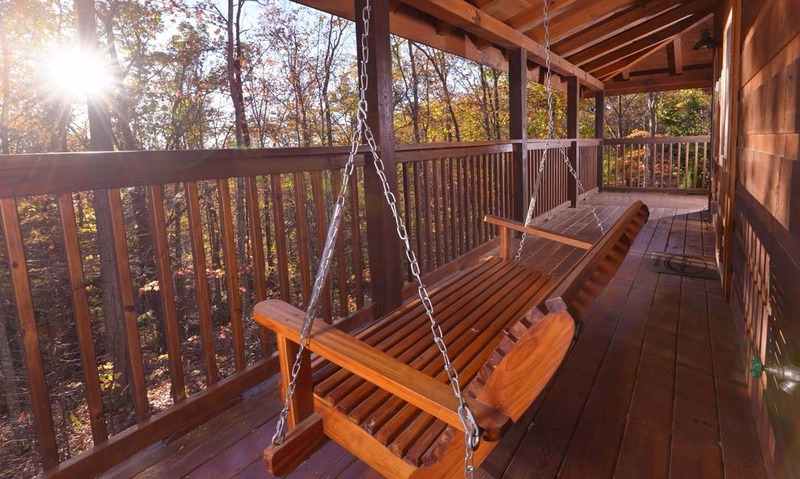 Besides the peaceful sounds and sights of the Smoky Mountain trees, Amy’s Place offers a swinging bench that overlooks the woods, a row of rocking chairs, a patio table, and an outdoor hot tub for the perfect way to warm up on a cool fall evening. This semi-private cabin is ideal for groups hoping to escape the busyness of the big city and the demands of home so they can completely immerse themselves in the tranquility of the Smoky Mountain trees. 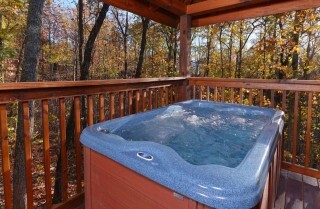 Along with your outdoor hot tub, Amy’s Place provides pool access as part of the Cobbly Nob Resort! Your family will love this feature in the late spring and summer when you’re looking for a fun way to cool off. 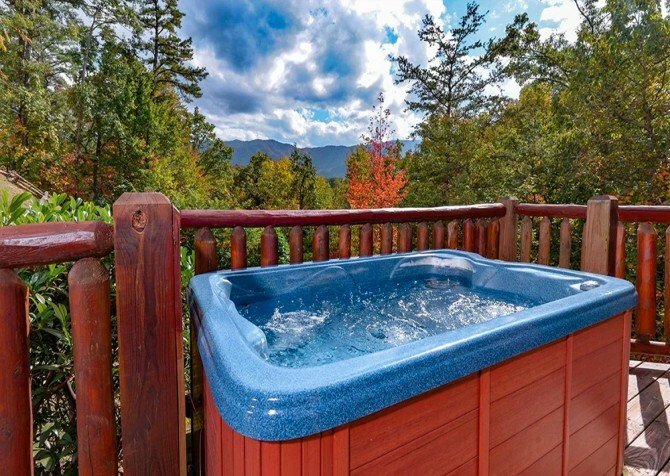 The resort actually offers more than one outdoor pool to its guests, so pack your swimsuits and enjoy some outdoor time in the Smokies during your stay at Amy’s Place! 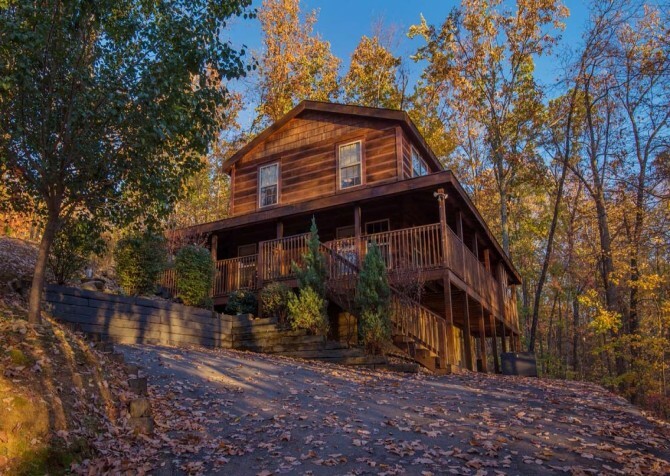 Back at the cabin, Amy’s Place also offers a paved (though steep) driveway. 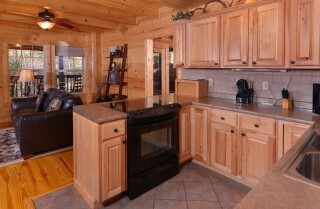 Inside, enjoy high speed wireless internet and a washer/dryer set along with your other convenient amenities. 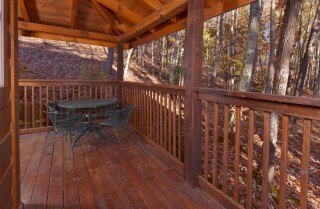 And on the deck, a gas grill makes family cookouts a cinch! Enjoy juicy burgers or grilled barbecue chicken for a delicious Memorial Day feast. You haven’t fully experienced the Smokies until you’ve hiked with a professionally trained pack llama! Along with your furry friend, Llama Treks hikes are accompanied by an experienced guide for an outdoor adventure you’ll not soon forget. Have you tried ziplining in the Smokies yet? Foxfire Mountain is the perfect place to start! 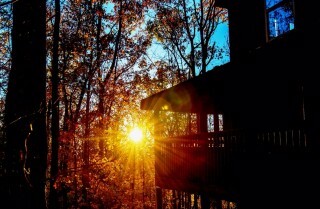 This 150-acre adventure park offers the highest zip line in the Smoky Mountains (475 feet high! ), ropes courses, and so much more. Rated the #5 aquarium in the world by TripAdvisor, Ripley’s Aquarium of the Smokies offers so much more than the chance to see some fish. You can splash with stingrays, pet a real penguin, and even sleep with the sharks at this exciting Gatlinburg attraction! "I am only leaving a 4 star for location cause of the ice and snow on drive ... causing us having to park at bottom of drive and risk falling to get in cabin! Facilities had the roads cleared leading up to the drive ...…"
"I am only leaving a 4 star for location cause of the ice and snow on drive ... causing us having to park at bottom of drive and risk falling to get in cabin! Facilities had the roads cleared leading up to the drive ... no salt at cabin to use for stairs and ice remained on stairs and porch entire stay .... now for the better part of the review! The pictures on website does not do this place justice! It’s very beautiful! I rented for my family of 5 ... but cooked dinner in the beautiful kitchen for over 25 people .... cozy but also very spacious ! ❤️"
We are thrilled you enjoyed your stay at Amy's Place. We appreciate you leaving feedback as well, as we have passed it along to the proper departments for review. Again, thank you so much for sharing your stay with us, and we look forward to serving you again in the future. 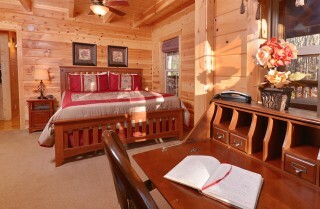 "This cabin was beautiful! There isn't one thing I would have changed about it. Was great for my family of 4. We took the bed room upstairs, my son took the couch, and my daughter had the other bedroom. 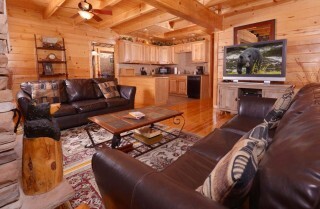 If you are a wildlife person this is the cabin for you. We saw Mama Bear and her 4 cubs at least 2 or 3 times daily, wild turkey's and opossums. The drive way is very steep, so if you plan on going when there is a chance of ice or snow you may need snow chains. 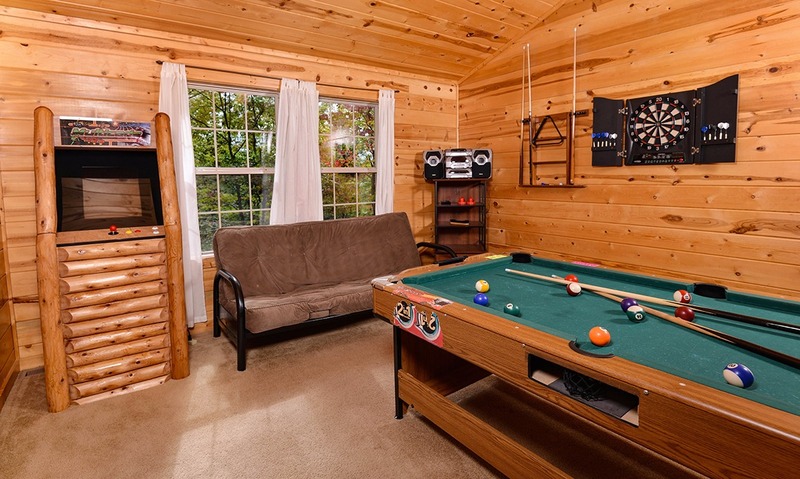 This cabin was very private. We will be staying here again. Only complaints which are mild is the dart board didn't work. Looks like it needs some new darts, and the pool table which is a 2 in 1 Pockey table didn't flip. The arcade was great, and the Shuffle board was great! Can't wait to visit again." Thank you for leaving a great review! 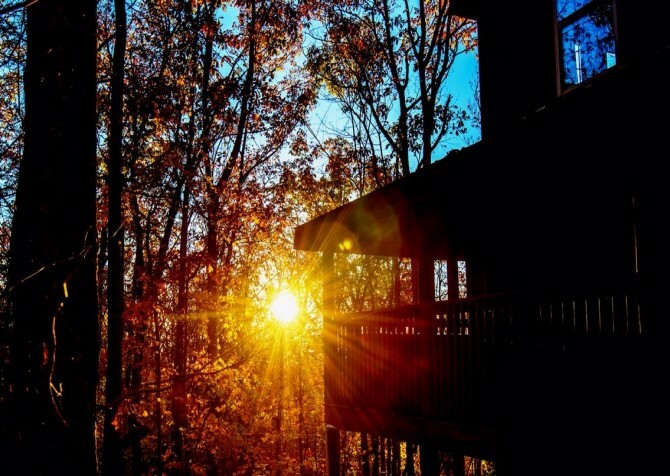 We are so glad you and your family had such a wonderful cabin stay at Amy's Place! The wildlife of the Smokies is truly amazing, and it's so cool you were able to see these awesome animals (from a safe distance). Again, thank you for the feedback. We've already let the appropriate departments know about the game issues, and they will be fixed as soon as possible. 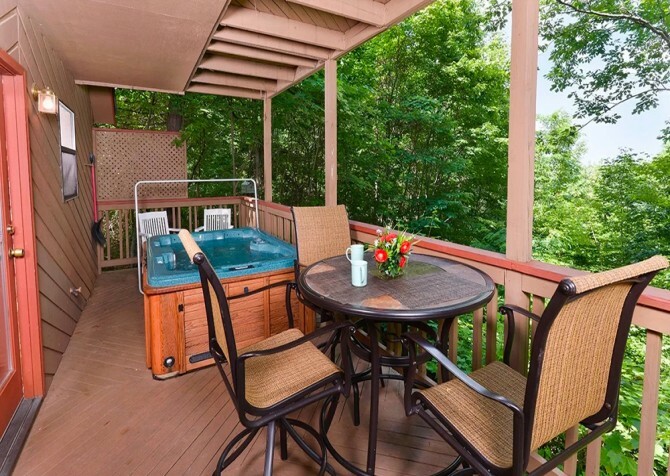 Come back soon for another amazing stay in the Gatlinburg! "Just checked in to Amy's Place, and we are already in love. It's a beautiful cabin and that's an understatement. My kids absolutely love it, it's well-kept and everything is in great working order. My biggest compliment, though, is that I asked a week or two in advance for the facility to measure the width of the stairs, casually mentioning I had small children and would need to bring a baby gate with me. When we arrived, they had installed a baby gate for me at the bottom of the stairs. I was floored. Talk about amazing customer service! It was great, because we could just sit the kids down and they could wander around while we unloaded the vehicle. We have visited Gatlinburg many years but always went to hotel route. I will never go back to that! I'm already loving it and glad to spend the week here." 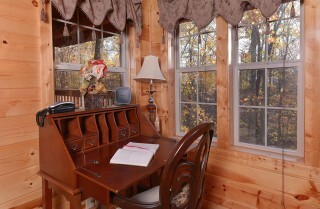 "We stayed in Amy's Place, by Cabins for You. It was spectacular. The best family vacation we have ever had. 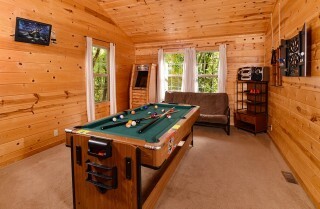 The real wood floors, the fireplace, the huge master bedroom, the game room, everything was very clean and very inviting. The drive up there was gorgeous. Would definitely stay here again and again." 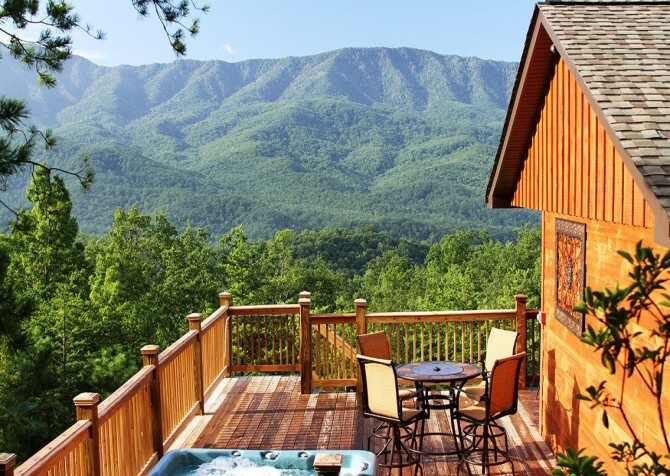 The Smoky Mountains Have It All! Reasons to Rent a Cabin in the Smokies!